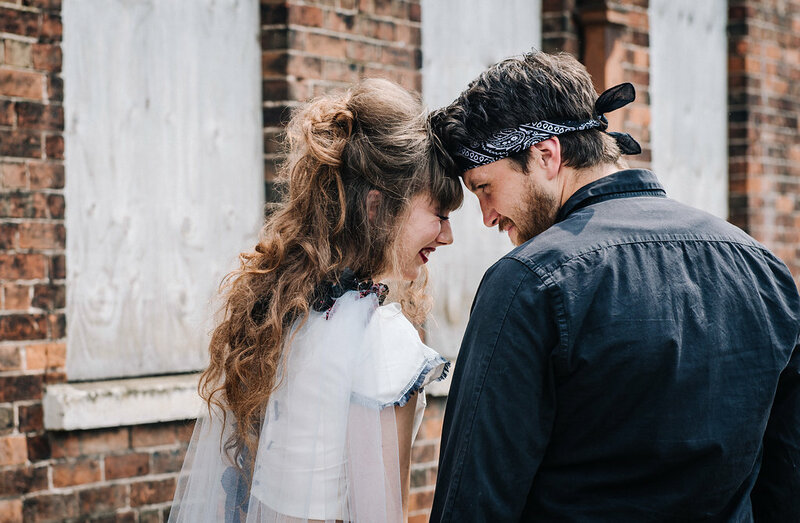 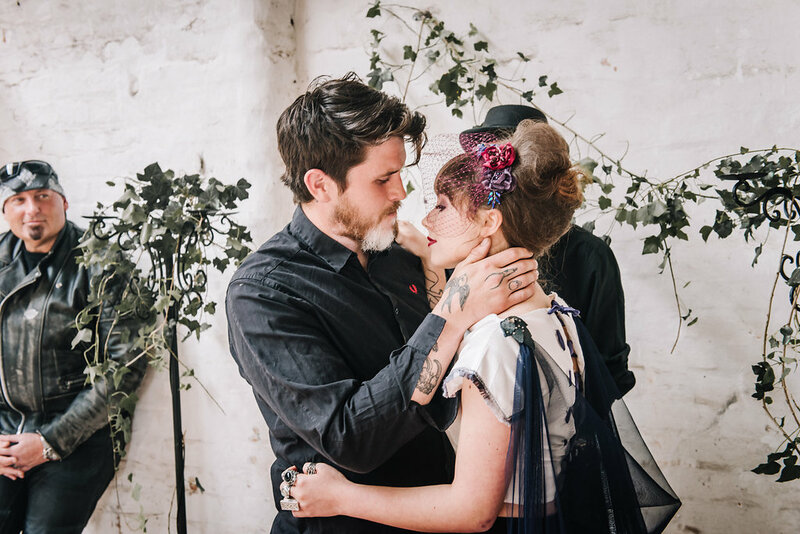 Sometimes music can reach down deep into your soul and inspire you and today I am excited to share a Whisky and Rock ‘n’ Roll themed Wedding styled shoot that takes that thought and with it creates something just a little rebellious and exciting. 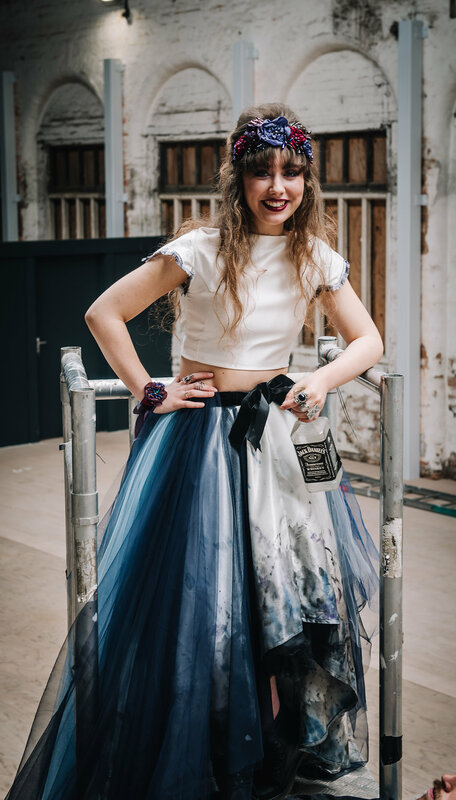 Those that know me will be aware of my habit of choosing a word to live by every year but for those that don’t, this year I choose #brave. 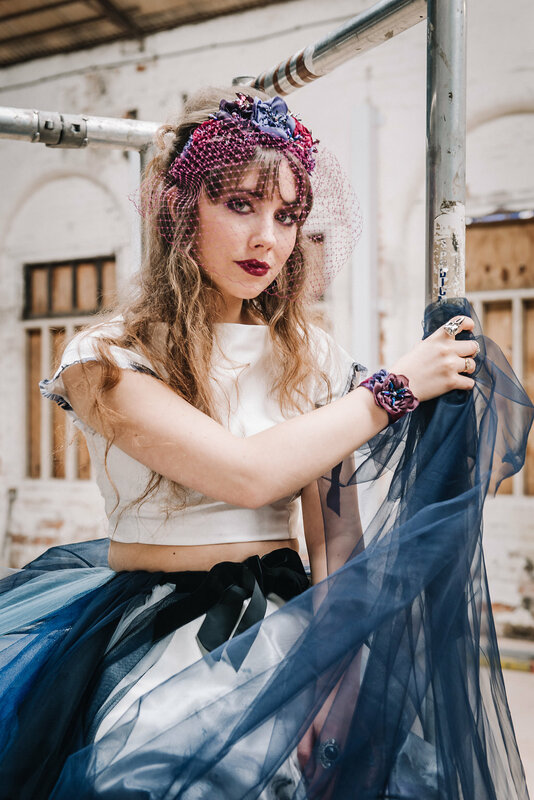 There are so many projects I want to do and so many ideas I want to play with but keeping the word #brave in my vocabulary has really pushed me forward this year. 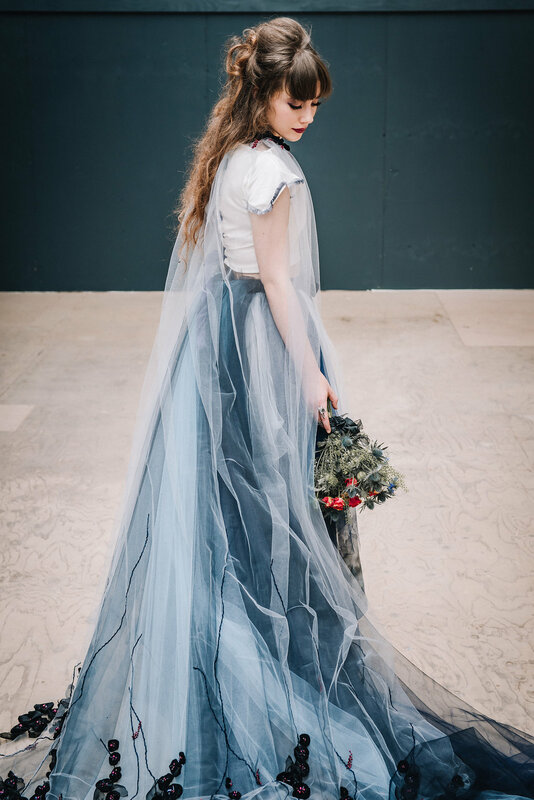 Ever since I worked as the behind the scenes photographer for my good friend Sophie Kerr Photography on her beautifully styled 70’s Bridal shoot last spring I’ve been inspired to do a styled shoot of my own. 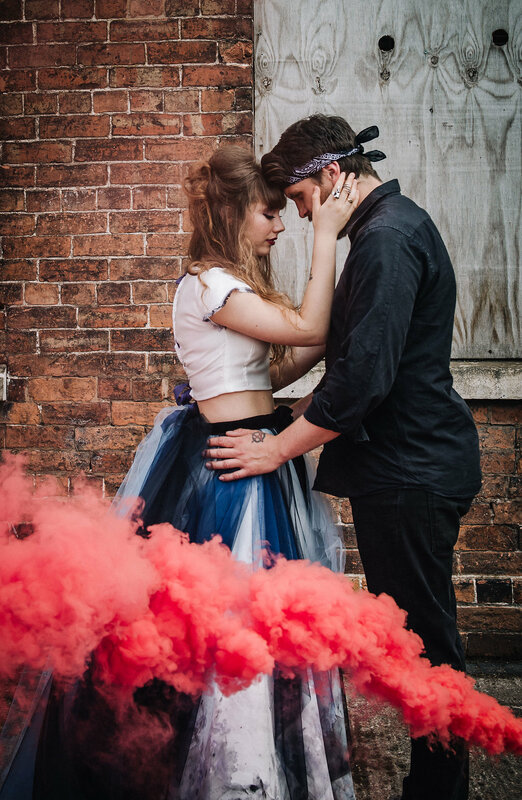 Something that would let me play with smoke bombs, light and movement. 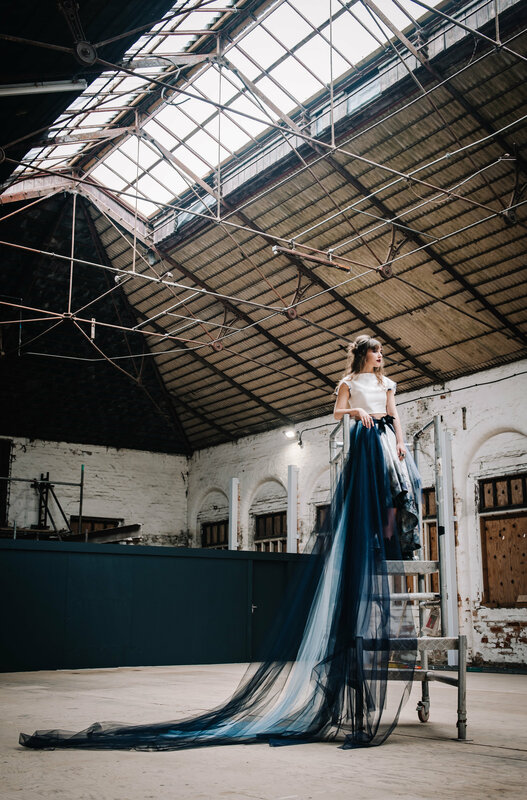 Here in Shrewsbury we have an amazing building called The Flaxmill Maltings, an 18th-century structure currently undergoing renovation. 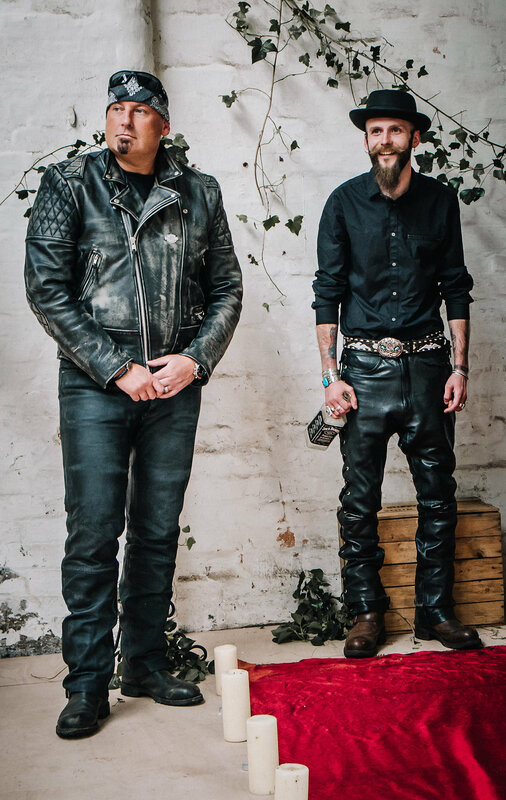 It is known as a precursor to the skyscraper due to its iron-frame construction. 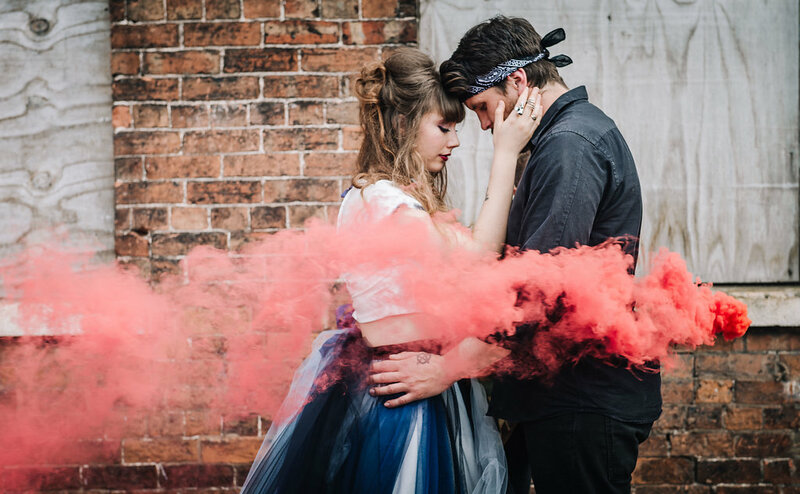 Inspired in part by it’s faded flaky paint, rusty beams and red brick I came up with a bit of a rough and ready rock theme combined with modern day Romeo and Juliet. 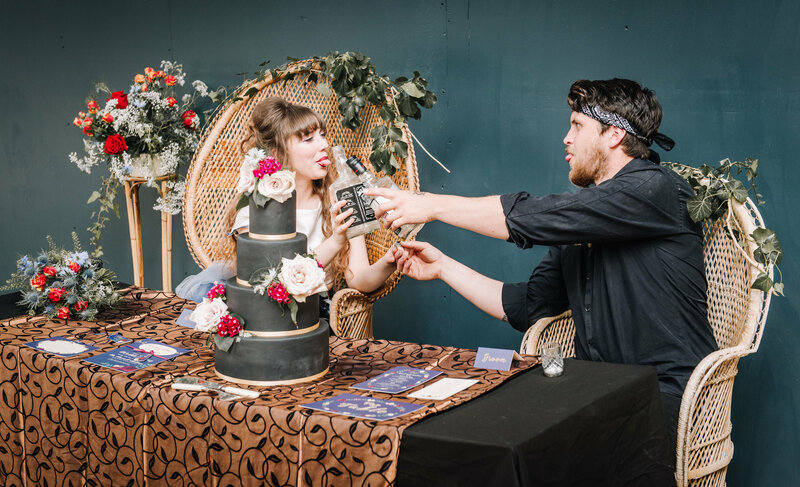 Only in this case they had a big wedding planned, invitations, cake the whole lot but in the end they decide to elope. 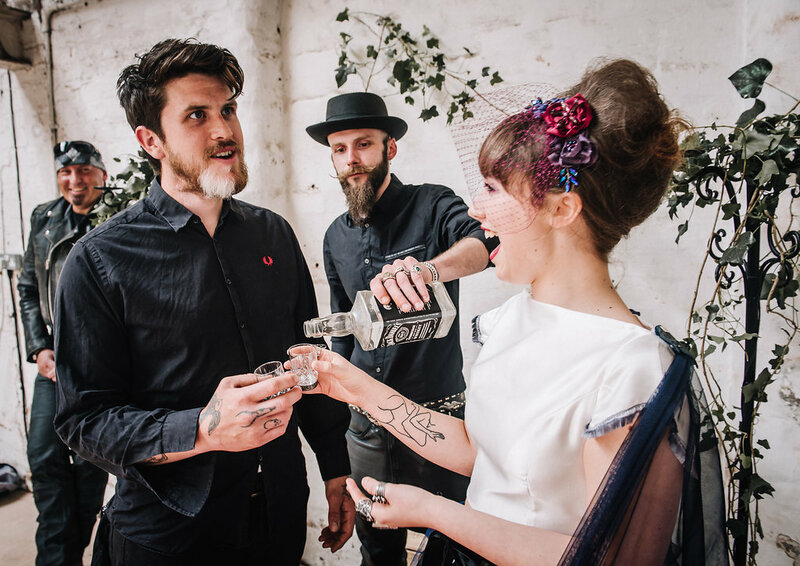 This is a sod the family lets get married, eat cake and drink JD kind of affair with their biker friends as witnesses and their one friend an ordained minister to marry them, with Jack Daniels shots instead of wedding rings. 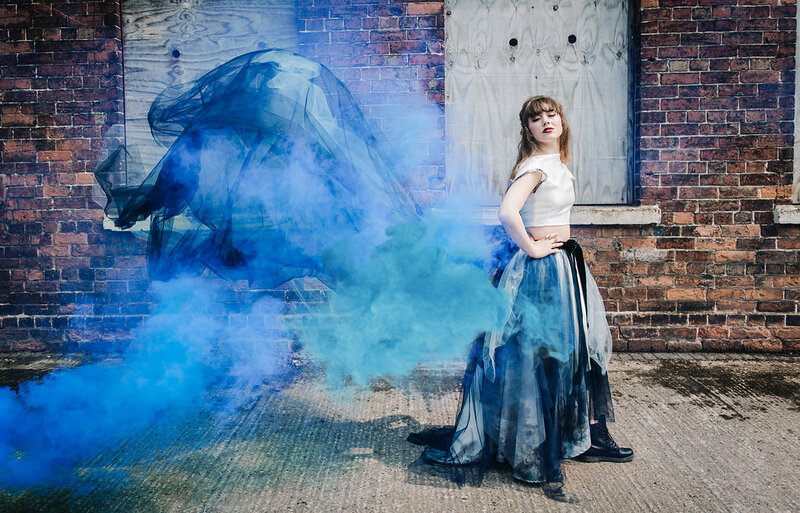 I very much wanted it to be a collaborative project celebrating and promoting the craft of Shropshire Creatives. 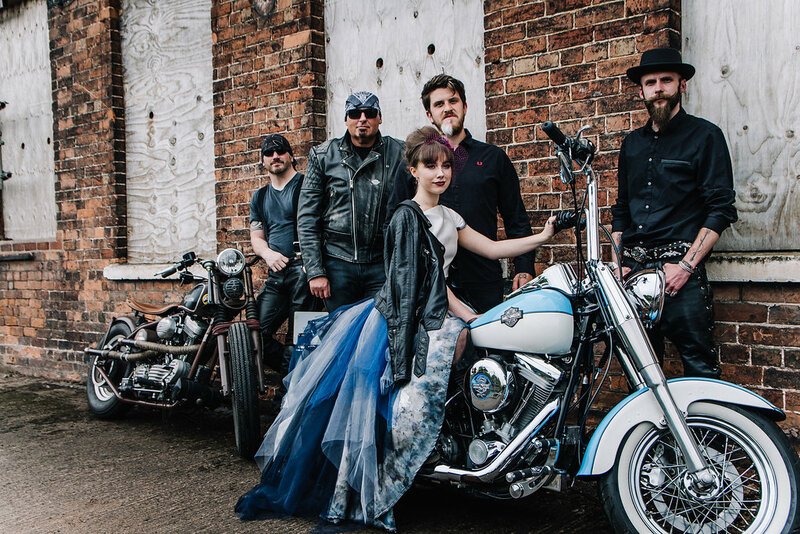 I started planning in February collecting fabulous people and props, including 3 Harley Davidson’s and peacock chair, along the way, until 1 became a team of 15. 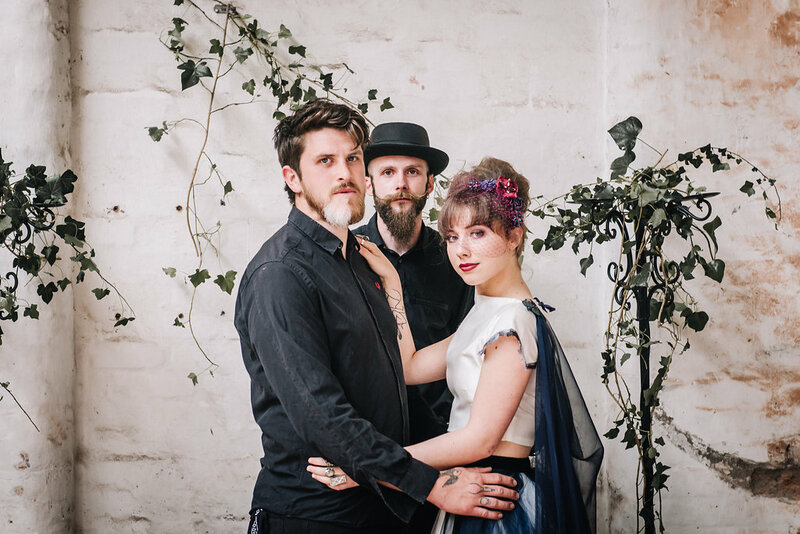 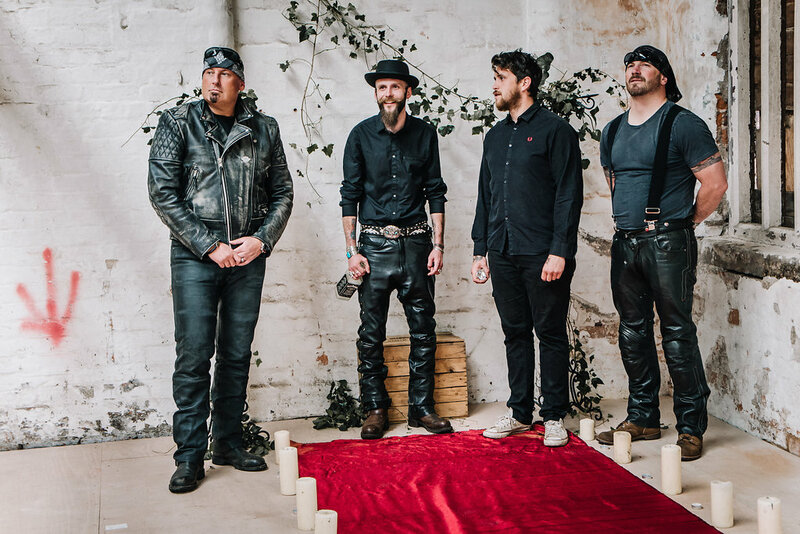 A videographer, hair, makeup, cake, florist, accessories, stationery, behind the scenes photography, 2 models, 2 witnesses and a memorable moustache in the shape of our ‘minister’ Lee from the local band Two Faced Tom and the Bootleg Boys and me. 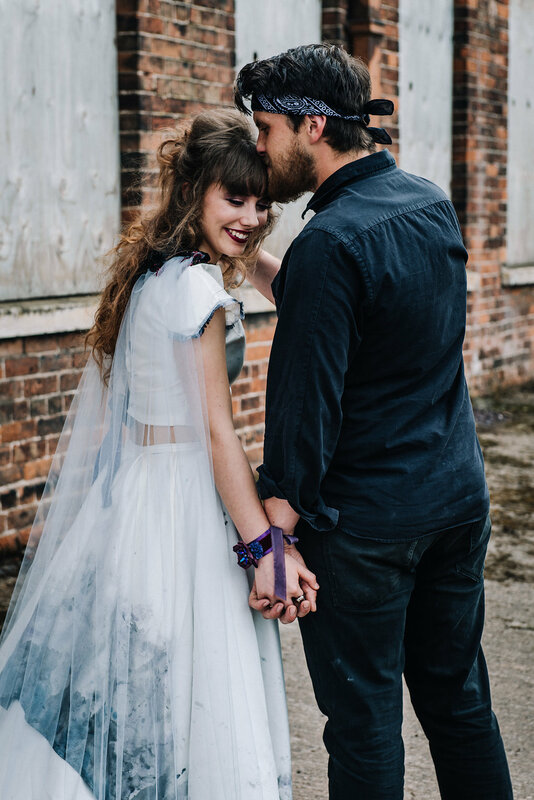 We’ve had meetings, make-up trials, dress fittings, location reccys, exchanged ideas, got excited, laughed and worked really hard for it all to come together on the day. 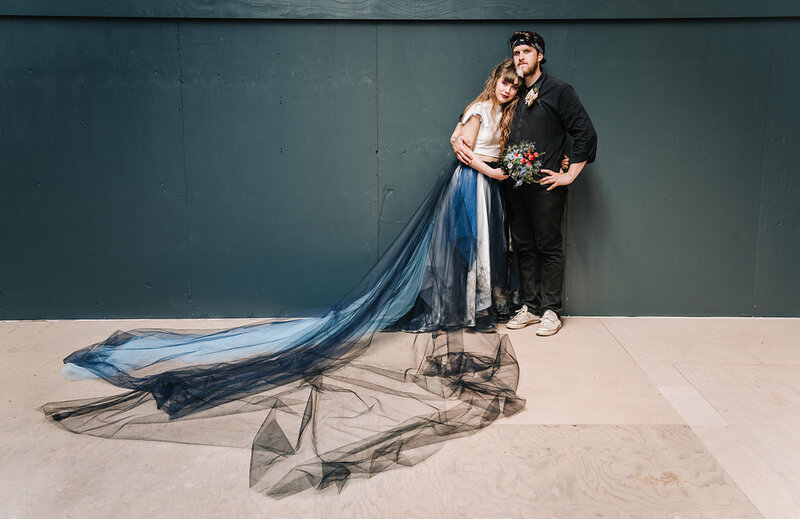 I have never done a styled shoot and never done any project management to speak of but I think we pulled it off. 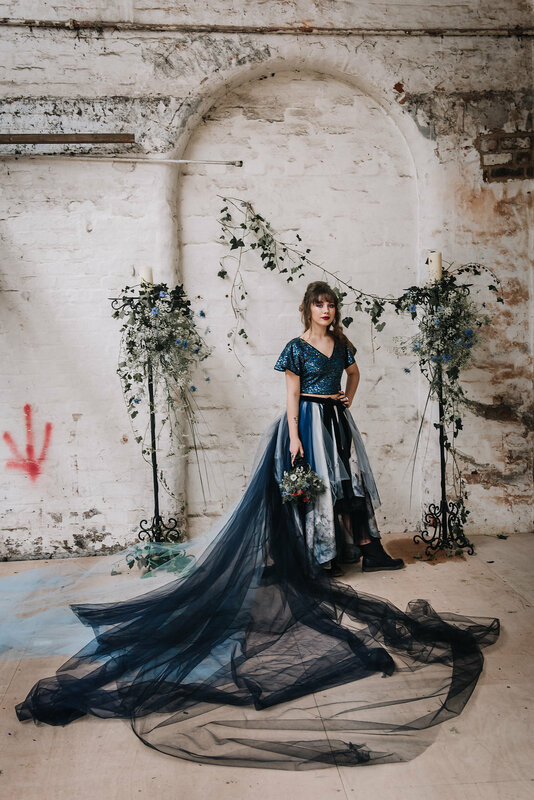 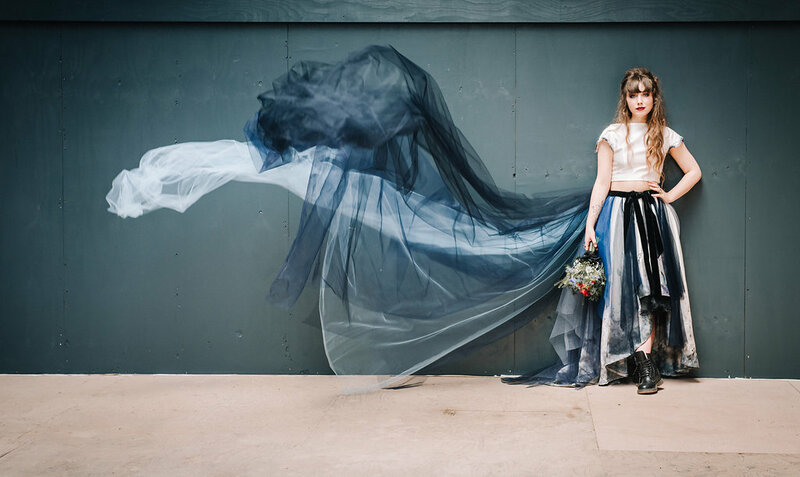 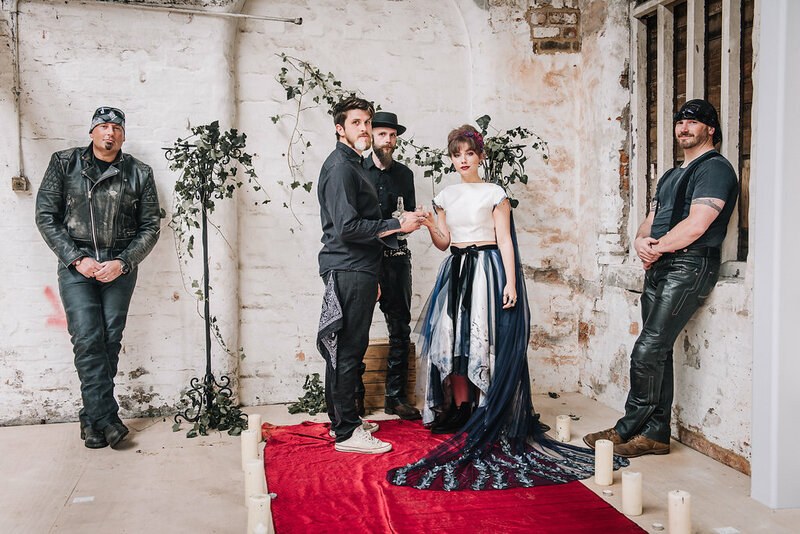 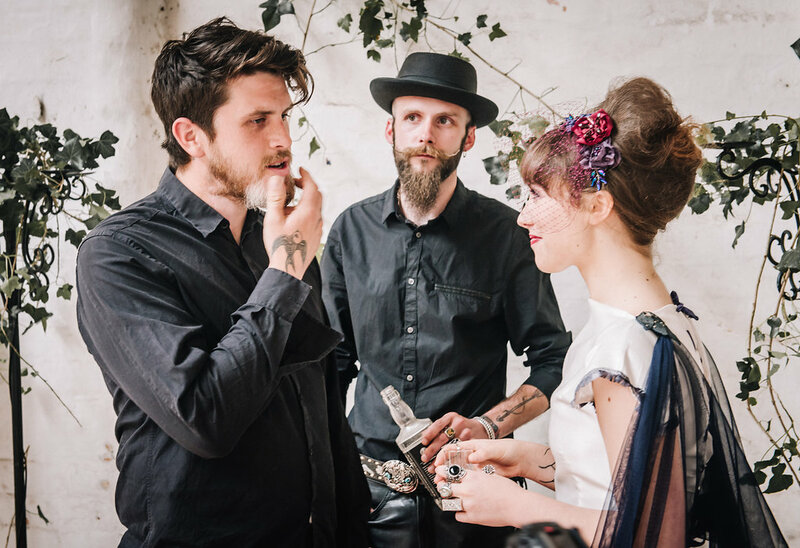 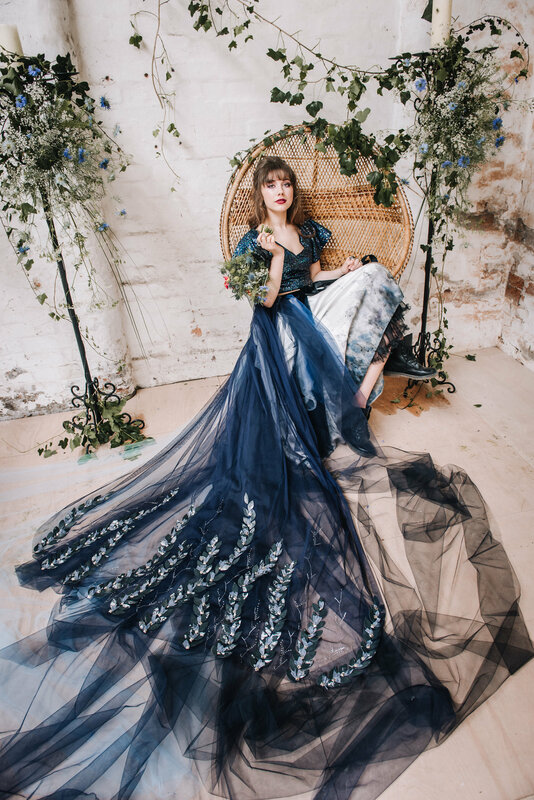 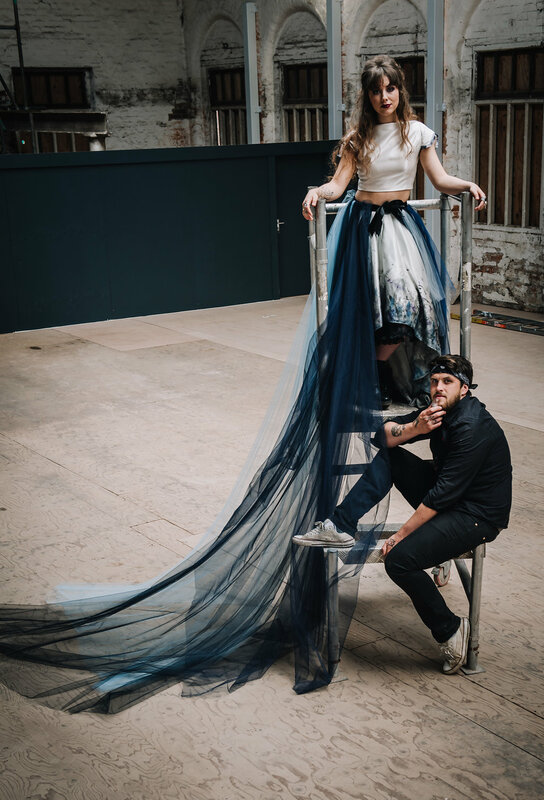 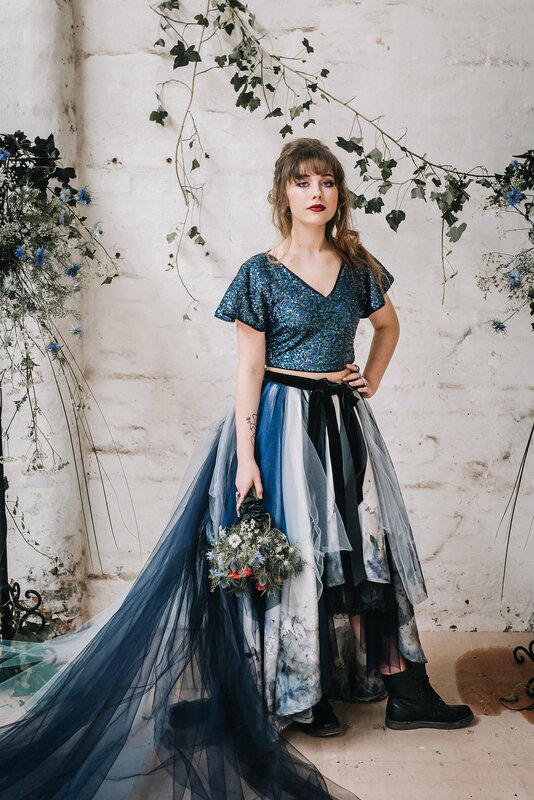 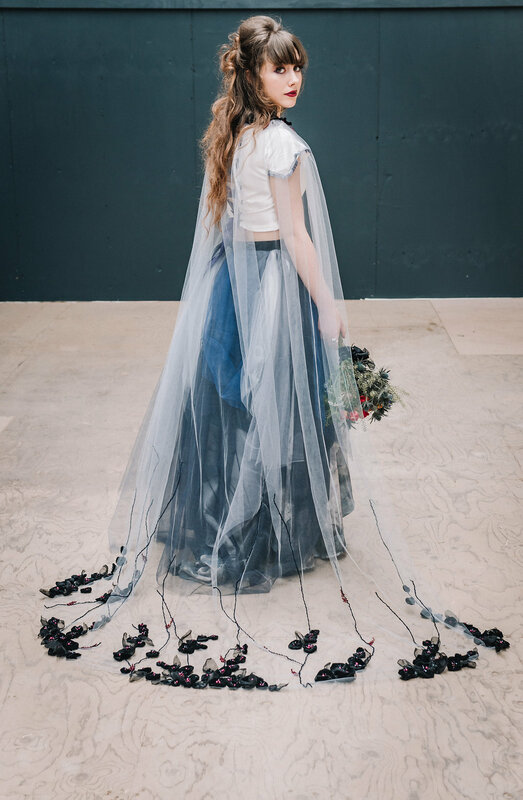 The dress was handmade especially for the shoot by the delightful Ashley from Adorn by Ashley beautifully dip dyed with two veil capes to choose from that were hand embroidered with black velvet flowers and beading and layers of tulle. 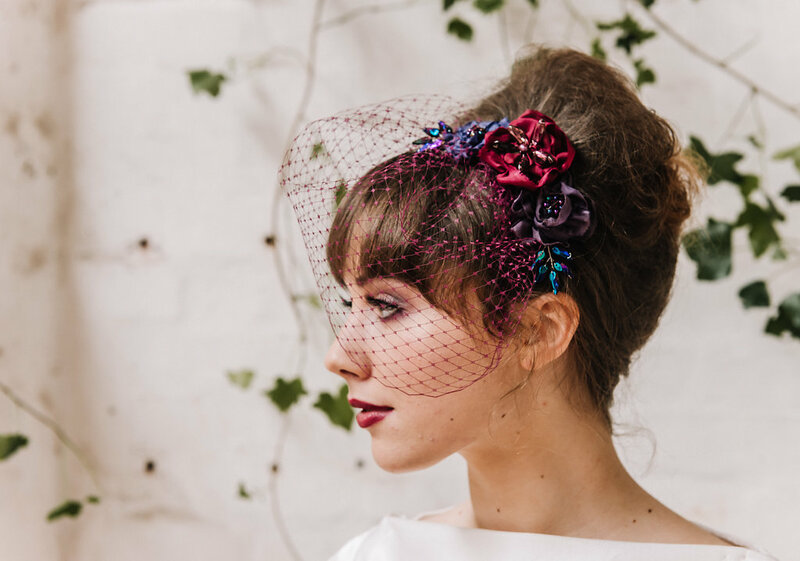 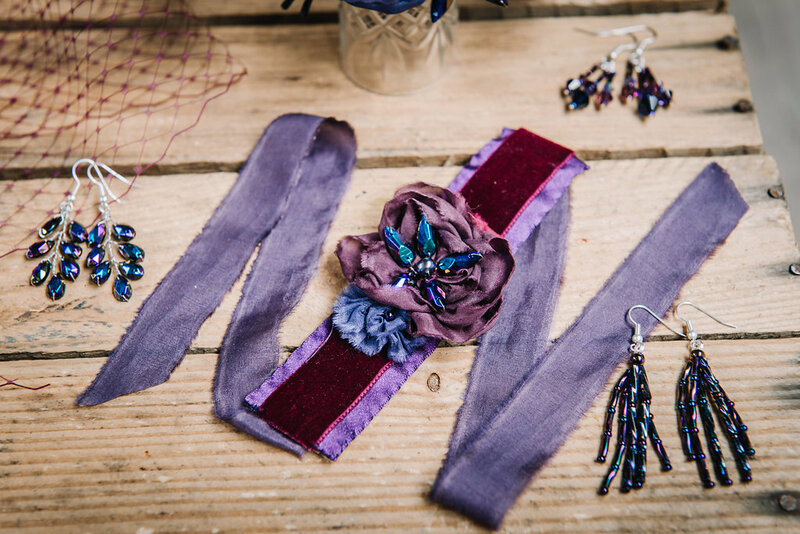 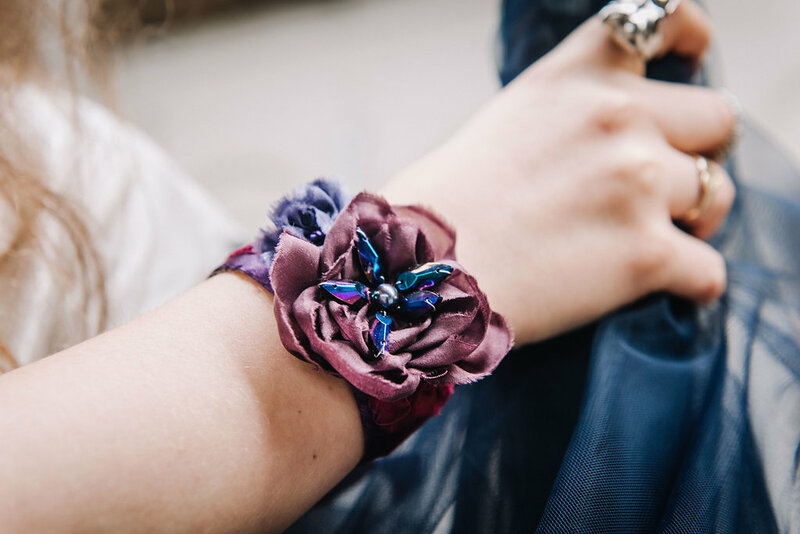 We had handmade hair accessories, earrings and a cuff made using hand dyed silks and imported glass beads and pearls by the award winning Julieanne Bird. 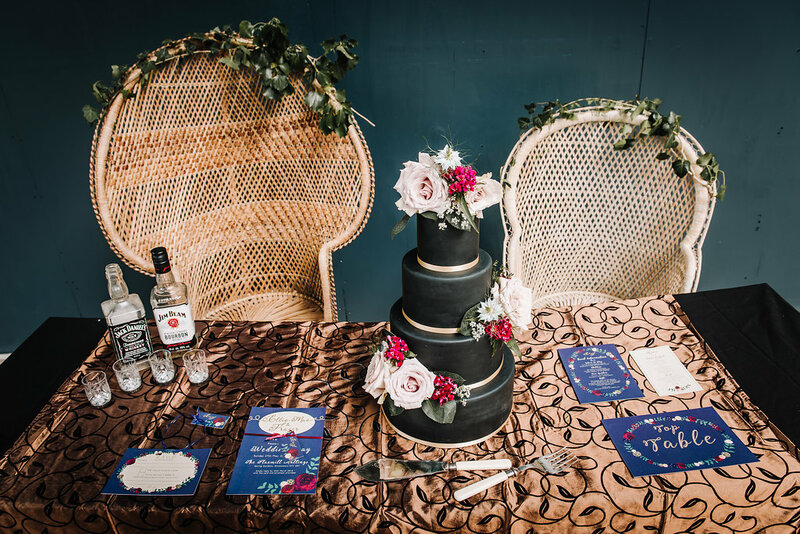 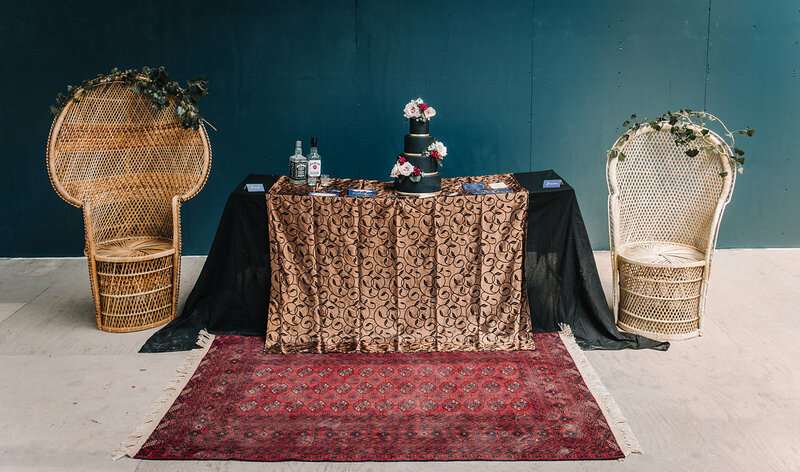 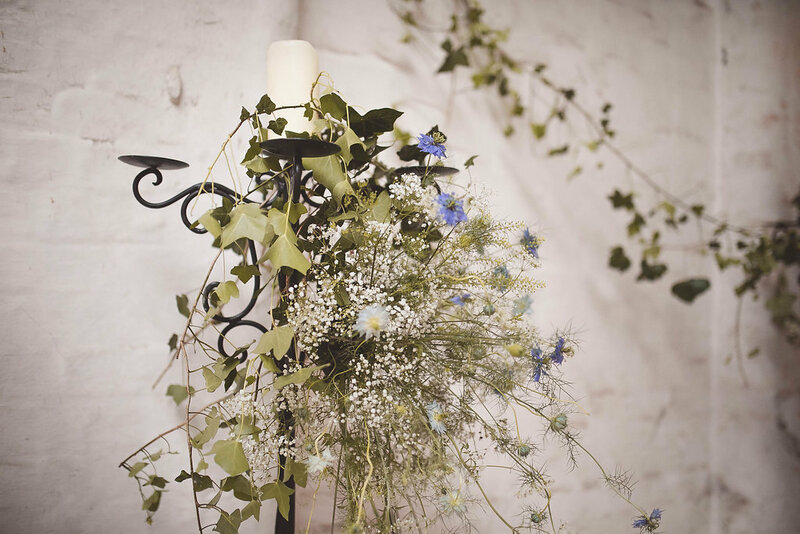 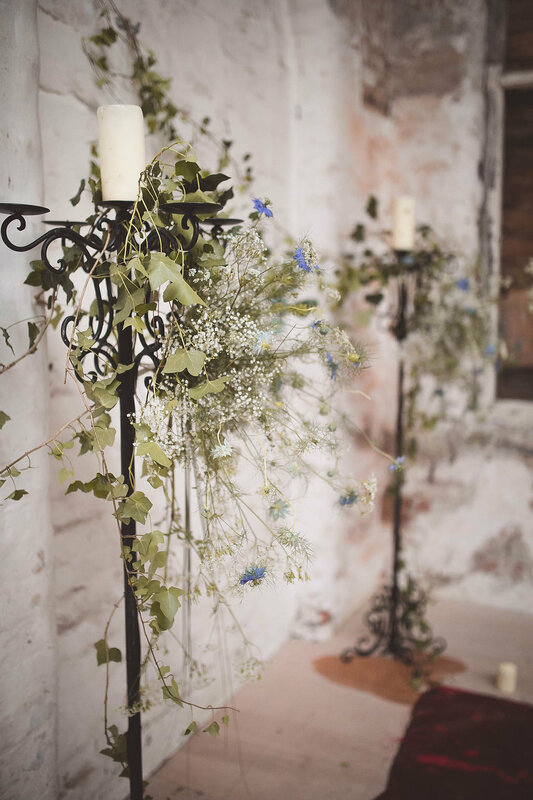 Keeping with the darker rock theme I asked Annie from The Sugarcart to make me something in keeping with the concept and she made this stunning 3 tier cake with black icing and fresh flowers from Joyce at Lulu Flowers who provided all the beautiful blooms for our shoot. 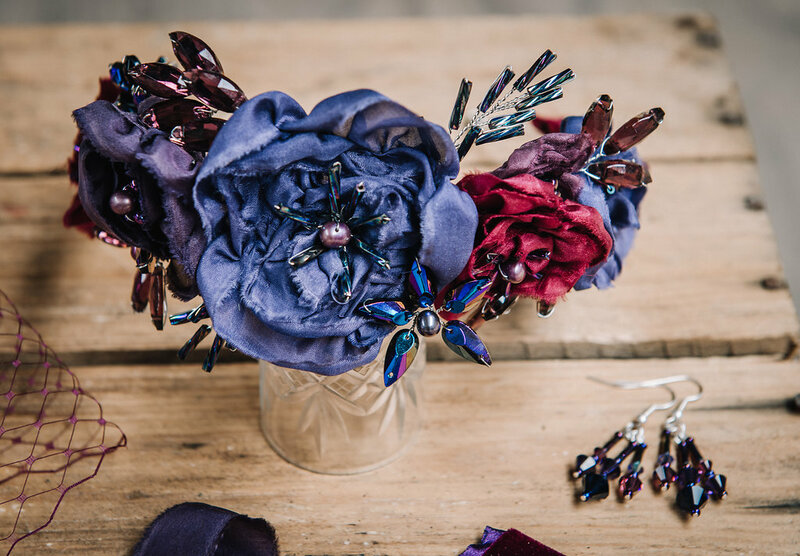 I love her mix of colours and use of non-traditional flowers to make her unique bouquets. 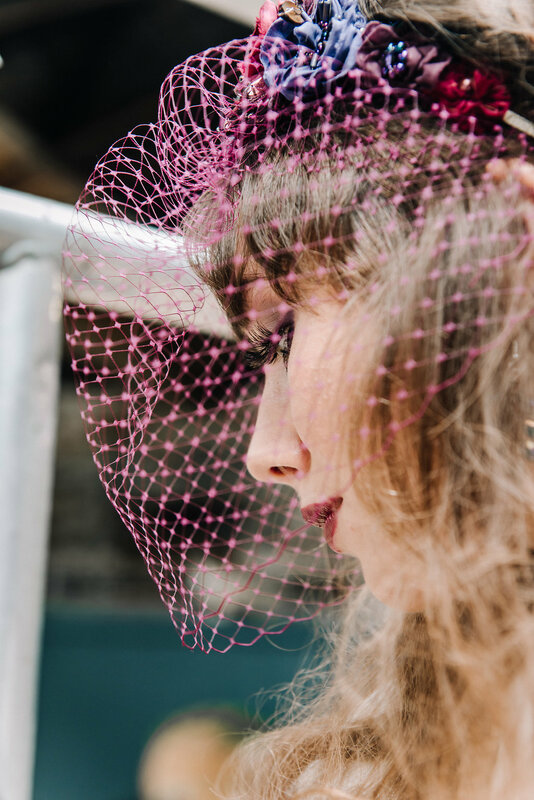 We had Miranda from Miranda Etheridge Beauty provide our make-up for the day, such a talented lady she matched the look perfectly to match Julieanne’s gorgeous birdcage veil and silk flowers. 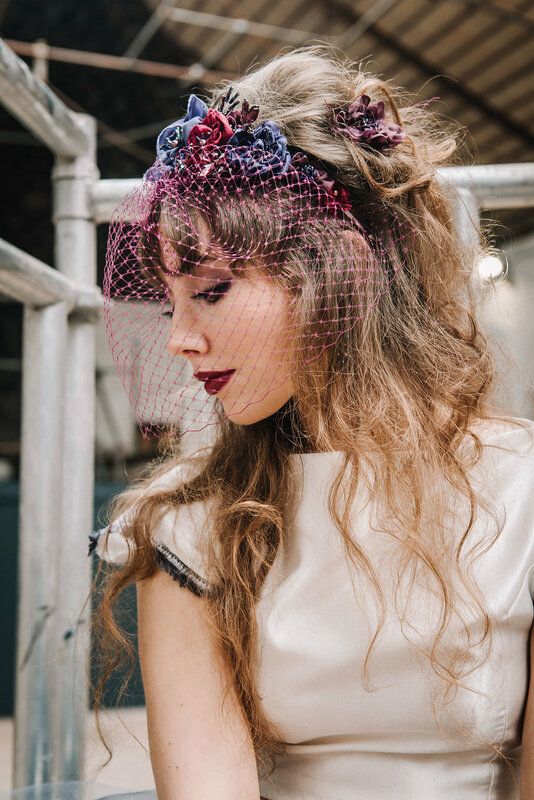 My friend Fran Hansan is a bit of hair wizard and transforms hair with colour in stunning ways. 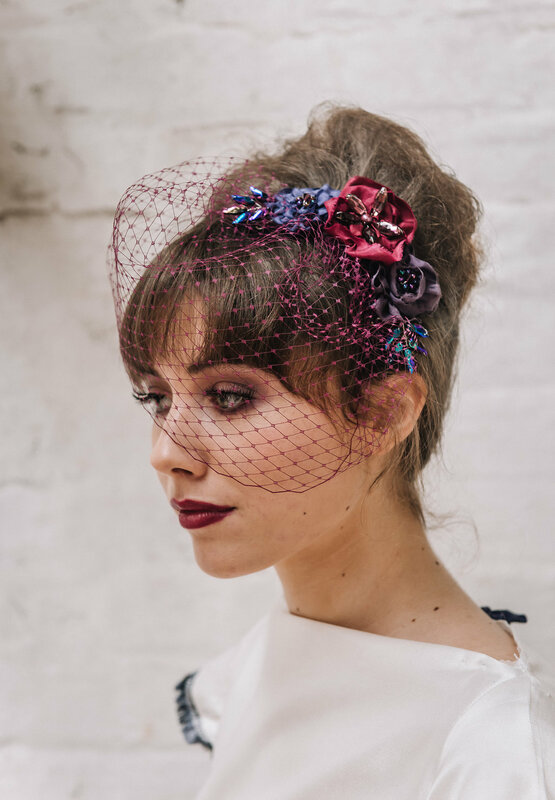 For the purposes of the shoot she created two styles, beautiful up do and a gorgeous hair down. 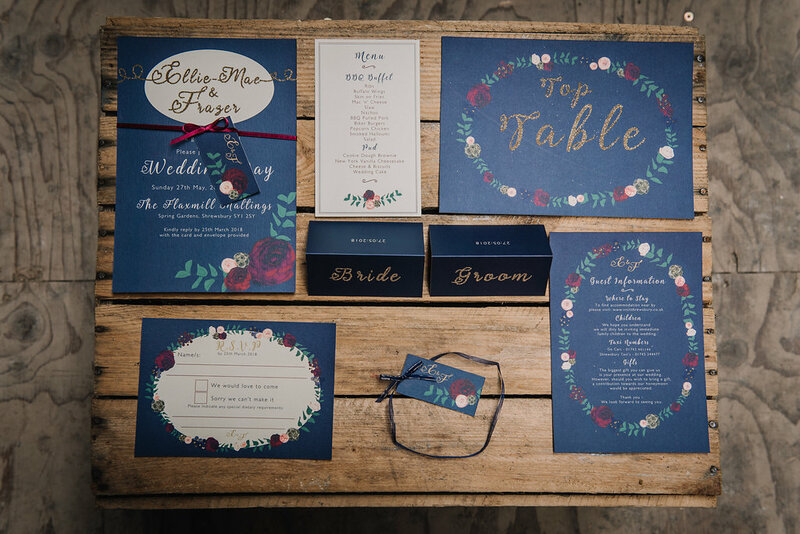 The beautiful stationery was created by the very talented and very lovely Anna from Evelyn and Elliot. 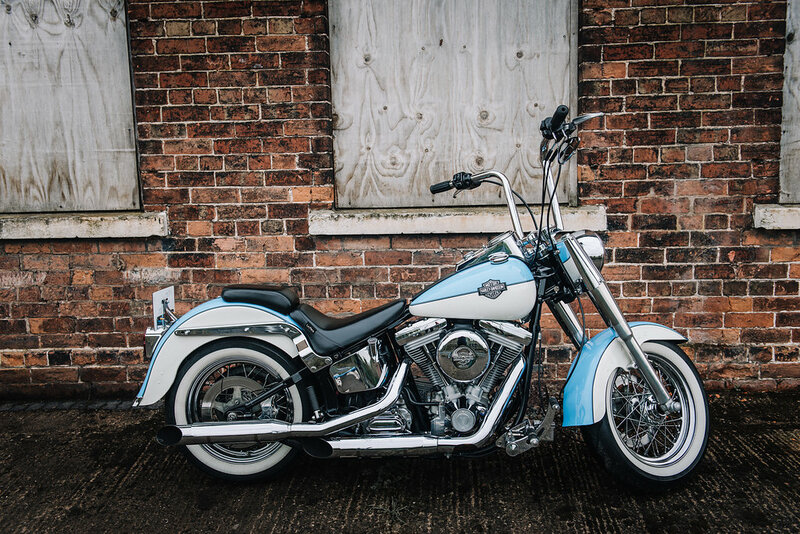 The amazing Harley Davidson’s were courtesy of Grant and Bob, and also Lee from Two Faced Tom and the Bootleg Boys also brought his own bike along. 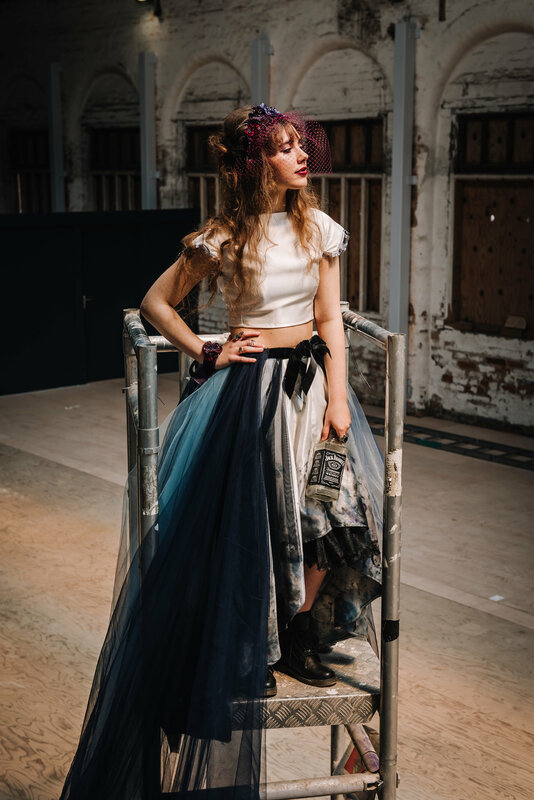 And last but not least many thanks to Historic England for allowing us to use their incredible space of The Dye Room at Shrewsbury Flaxmill Maltings. 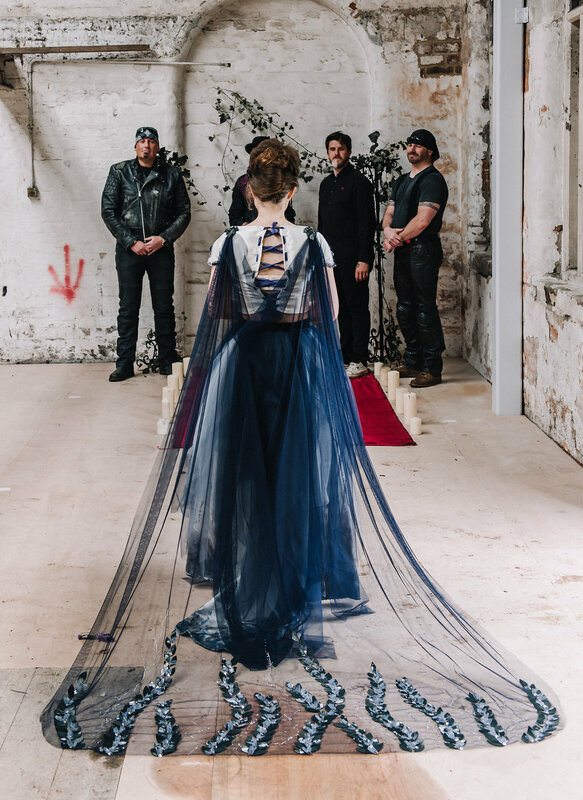 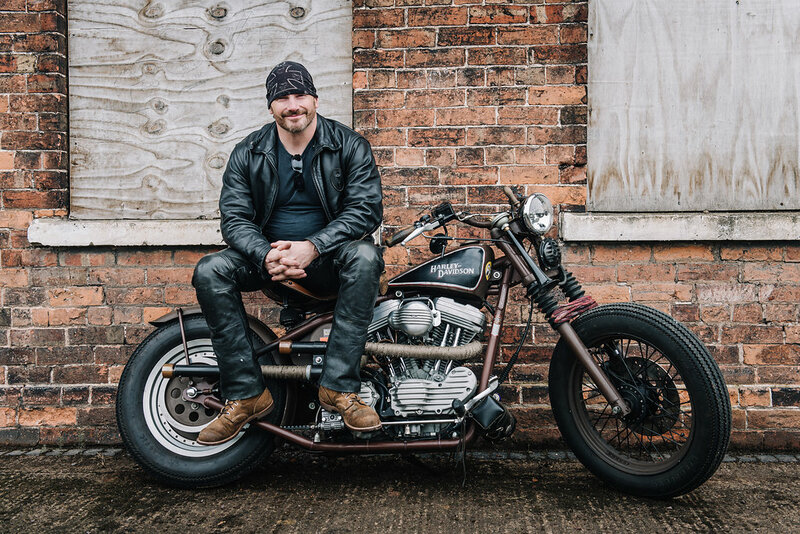 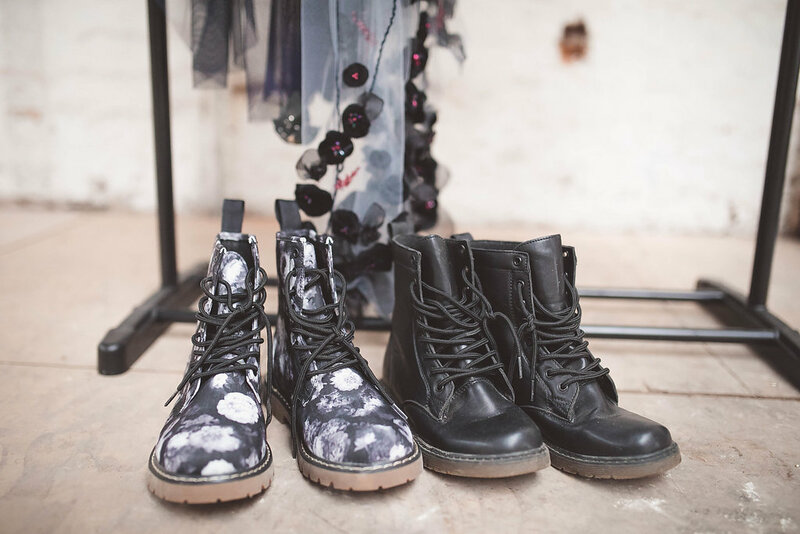 Crank up the dial for this outstanding behind the scenes shoot film by KAE Films….